Founding Scholar | News and Features | Style Weekly - Richmond, VA local news, arts, and events. An acclaimed Richmond author takes up residence at George Washington's home. Alan Pell Crawford is studying George Washington at the first president’s Fairfax County estate. On a drizzly Saturday afternoon in July, author Alan Pell Crawford sits in a green, wooden, spindle-back chair on the back porch of Mount Vernon, surveying the mile-wide expanse of the choppy, gray Potomac River from across George Washington's lawn. "That's an awful long way to throw a dollar," Crawford observes, chuckling, evaluating the old chestnut about Washington lobbing a silver dollar across the Potomac. The Richmond-based author of two critically acclaimed histories of the early republic, Crawford recently was named Mount Vernon's inaugural M. Elaine Rand Fellow, the first scholar in residence ever chosen at George Washington's famed Fairfax County estate. 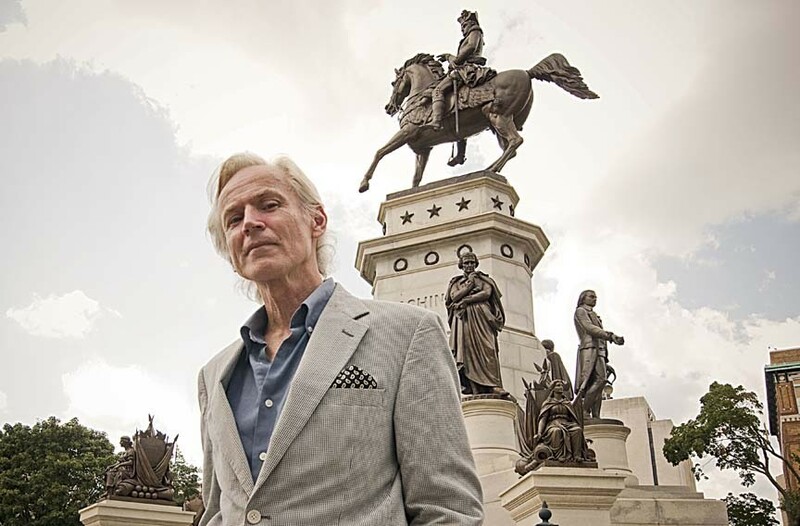 Crawford's next book will focus on Washington and the American Revolution. He's also been awarded research fellowships from the Boston Athenaeum and the International Center for Jefferson Studies at Monticello. Crawford's "interests in George Washington and Thomas Jefferson were compelling and we believed he would be a good initial scholar," says Stewart D. McLaurin, vice president of the Fred W. Smith National Library for the Study of George Washington. The fellowship allows writers to live in apartments at Mount Vernon for research purposes. Washington's plantation says much about America's first president, Crawford observes: "If you compare it to Versailles, or even Monticello, it's a modest thing. … It's great that his idea of what his image should be was an admirable one, of modest restraint." Unlike previous works, Crawford's Washington biography will examine the books, philosophies and experiences that shaped Washington into a legendary leader. "He was very rarely the smartest guy in the room but all the people who were better educated and better read and better able to discuss great ideas and philosophers, they worshipped Washington," Crawford says. "They were all in awe of the man's gravitas and the sense that he would make prudent decisions and would not be irresponsible with power." With his aquiline nose, patrician cheekbones and swooping, long white hair, Crawford, 59, wouldn't look out of place at a Central Casting call for Founding Fathers. A slender, gregarious man, he evokes Tom Wolfe, whom he once interviewed for an article in Richmond magazine about Wolfe's childhood here. Crawford would be the epitome of the cultured, mannered Virginia gentleman, save that he was born in Indiana. Crawford is certainly at home in Virginia, though, at least in its early-American days. His 2000 book, "Unwise Passions," was a biography of Virginia aristocrat Nancy Randolph, who was defended by Patrick Henry and John Marshall in a sensational trial in which she faced charges of aiding in the murder of her infant son born from a liaison with her brother-in-law. Crawford's 2008 follow-up, "Twilight at Monticello: the Final Years of Thomas Jefferson," was a Washington Post bestseller published by Random House. His lectures on Jefferson have drawn standing-room-only crowds at Harvard, the Library of Virginia, Monticello and other prominent venues. Crawford was "very popular" when he spoke at Mount Vernon about Nancy Randolph, says recently retired Mount Vernon President Jim Rees, who created the Rand Fellowship. He hopes scholars such as Crawford will produce more reader-friendly books about Washington; Rees chose Crawford as the inaugural fellow because Crawford's books appeal to a wide audience, "not only those that have a Ph.D. in history." Crawford's "writing is so rapturous that he draws you in and compels you to read what he has written," says Elaine Rand, the retired U.S. Treasury Department analyst and longtime Mount Vernon volunteer who endowed the fellowship. "He really pulls you in and keeps you there. It's a great attribute." Crawford has lived in Richmond since 1993. His wife of 25 years, Sally Curran, is editor of the membership magazine at the Virginia Museum of Fine Arts. They have two sons, Ned, 21, a Virginia Commonwealth University student, and Tim, 16, who attends Open High. A graduate of Indiana University who majored in history and English, Crawford interned for the Washington Post during the climax of the Watergate scandal, sitting three desks away from Bob Woodward and Carl Bernstein. He was in the newsroom the day Nixon resigned. "There was a remarkable sense of awe and reverence, that this was a historical moment," recalls Crawford, who in his 20s wrote a book about the new American right wing. He later worked on Capitol Hill, most notably serving as a speechwriter for U.S. Sen. James Buckley (brother of the late William F. Buckley Jr.) and press secretary to U.S. Rep. Ron Paul, before moving to Richmond to work in public relations. Crawford also has maintained "one foot in freelance journalism," writing for the Wall Street Journal, the Washington Post, the New York Times, the Weekly Standard and Vogue. He's a former columnist for Adweek magazine and Washington's City Paper. It may be years before his Washington book sees print, but in the meantime Crawford is enjoying getting better acquainted with the father of a nation. Whereas his Jefferson book was an elegy of a great man's waning years, his Washington book will be "a rollicking yarn," he says. "This is a good, energetic story of a man of action." Washington is a study in contradictions. He was the squire of Mount Vernon, a man comfortable with gentry. But he also was a surveyor and solider who slept in the wilderness, worked the land and fought alongside commoners. He was no effete philosopher like Jefferson, Crawford notes. His childhood schooling was poor and he took pains to educate himself. Though books have examined Washington's leadership skills, they were written through a prism of modern thinking. Crawford is reading from Washington's personal collection of books and he aims in his research to uncover how a man who read European tomes on military leadership went on to become an unprecedented egalitarian. "He puts trust in generals who have no education, who have no background, who have no family, who have no money," Crawford says. "He put people in command who happened to be the last people European princes would have put in charge of an army and they did great things with their own ingenuity, their own inventiveness, their own resourcefulness.